I’m never a big fan of almond. Almond nuts in cookies and cakes I’m fine, but I’m not fond of them. I’m extremely turned off by almond jelly, almond drink… and almost all kinds of “almond-enhanced” products. I vaguely remembered once I walked past this shop that was selling almond drink – mixed with soy milk. God the smell was horrible and I”m a little disgusted. Can’t they just keep soy milk to be original soy milk? YUCKS. Hence I never thought that this tart will become a favourite of mine. I first tasted it a week ago, during a baking class (those kind where you just sit and watch the demonstrator do the job – it’s boring). Ooh how I love the crust. Buttery, fragrant and crispy crust. Filled with a cake-like almond filling. Even my mom liked these tarts too. 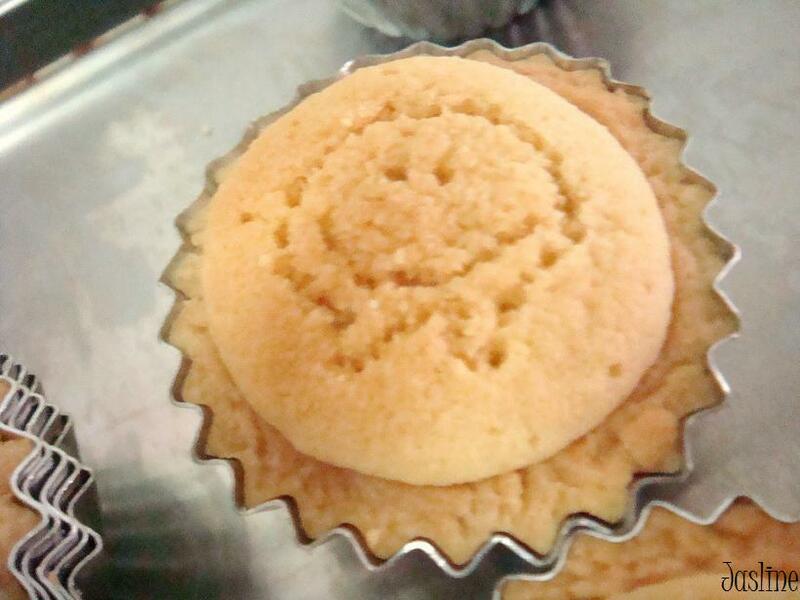 Therefore I decided to bake it again just for her (and of course myself as well :p). 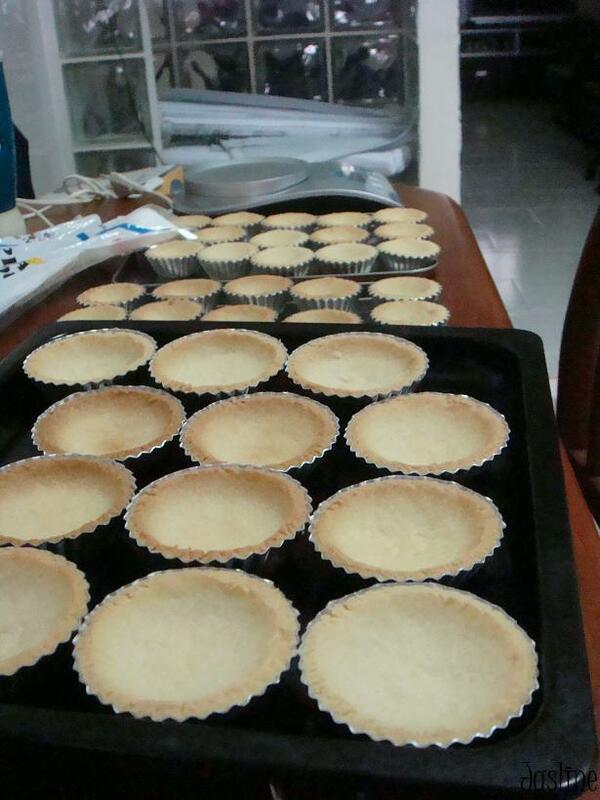 Making mini tarts can be tedious sometimes, as you have to get a lot of mini tart shells (and they are not cheap) and fill them in one by one. Then they have to be baked for a little while till they are half-cooked, which after that can then the filling be piped in and the baking resumes again. It is hard work, but I assure you – it’s worth it. Even if you might not like the almond filling, the crust can easily be baked till fully done then filled with slightly sweetened whipped cream and topped with fresh fruits like strawberries and kiwi to make mini fruit tarts. Another idea that I’m thinking is to fill the crust with dark chocolate cream and refrigerate till set to make dark chocolate tarts. YUM. 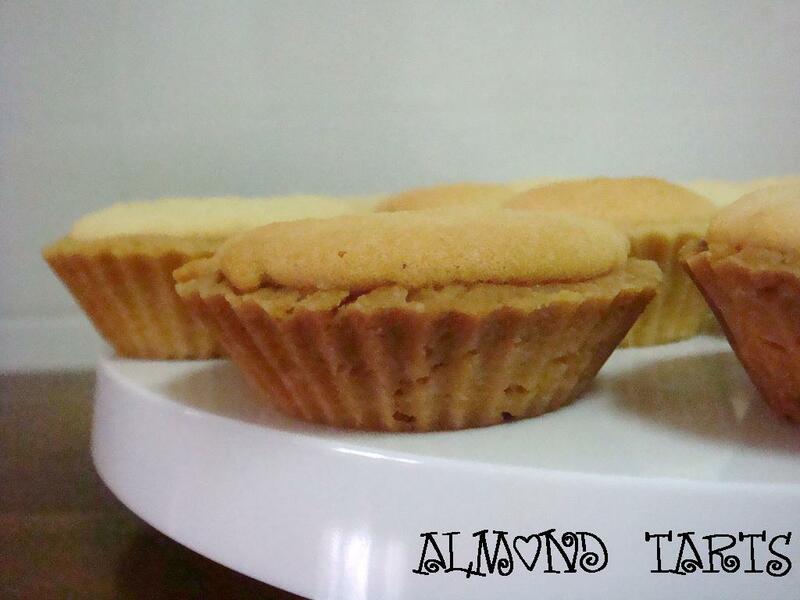 For this recipe, I used two kinds of tart shells (as I don’t have that many mini ones). The smaller one is a 2-inch (5 centimetres) tart shell in diameter while the larger one is 2 and 1/2-inch (6 centimetres) tart shell. Both have the depth of around 1 inch (2 centimetres). The tart shells do not need to be oiled as at the end of the baking the tart can be popped out easily from the tart shell. 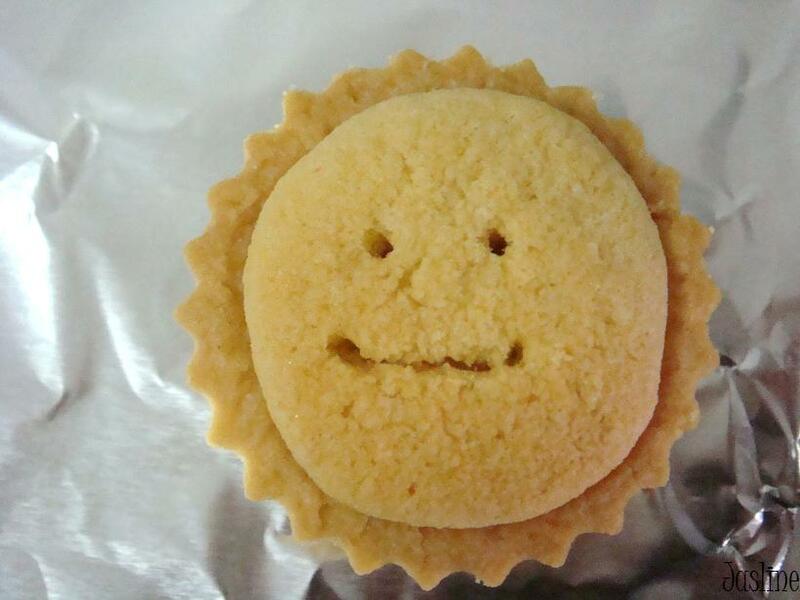 My friend and I used satay sticks to give these little sunshine tarts a new look. Hah. CRUST: Preheat oven to 180 degrees Celsius. Cream the butter and sugar together with an electric mixer, starting with slow speed and gradually increase to medium speed, 15 minutes or until light and fluffy, scraping down the sides occasionally. Reduce the speed to low and mix in the egg and the flour just until combined. Turn the dough out onto a clean, oil-free and flour-free work table. If the dough is crumbly, just gather them together until they form a dough. Press dough into the tart shells (thickness around 2-3 mm) and place on baking sheets. 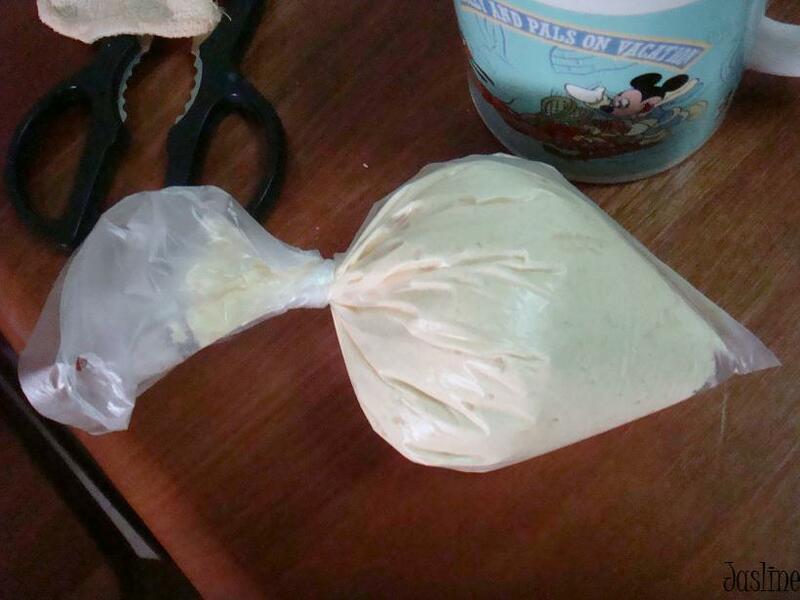 The dough will puff a during baking. Half-bake the shells on the medium rack for 15 to 18 minutes for the smaller tarts and 20 to 22 minutes for the larger ones until they are slightly browned. Remove from the oven and set the baking sheets onto racks to cool completely. FILLING: Reduce the heat of the oven to 160 degrees Celsius. Similarly, cream the butter and sugar together with an electric mixer for 15 minutes. Reduce speed to low and mix in the eggs, egg yolk, ground almond, flour and vanilla essence. Pipe (or spoon) the filling into pastry shells and bake on the lower rack until the crust is golden brown while the filling is golden, 20 minutes for the smaller tarts and 24 minutes for the larger tarts. Transfer the tarts onto racks to cool until warm enough to handle or let them cool completely (if you can resist the temptation!). Turn the tarts out and arrange on a platter before serving. VariationsAfter pressing the dough into the tart shells, bake the tarts until they are golden brown in colour. Remove and let cool completely before topping with sweetened whipped cream and fruits or with dark chocolate cream. 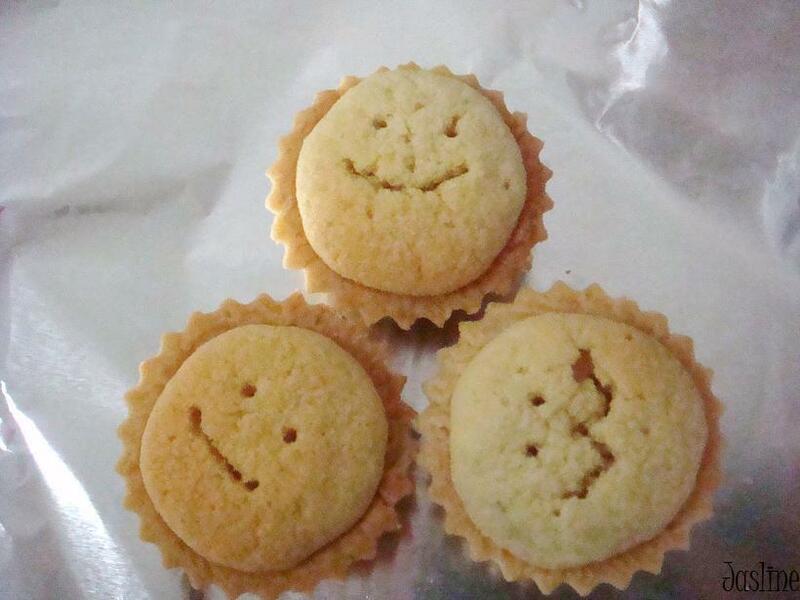 Cute tarts! Looking really good! Hi Apana! Thanks for visiting. I’ll visit your blog when I’m free! 🙂 Cheers!